Facebook has just announced that they will be launching an ‘App Center’ to enable their users to find social web, desktop and mobile apps. The stated reason behind the launch of this app center is to help users to find “the best apps” that their friends enjoy using. 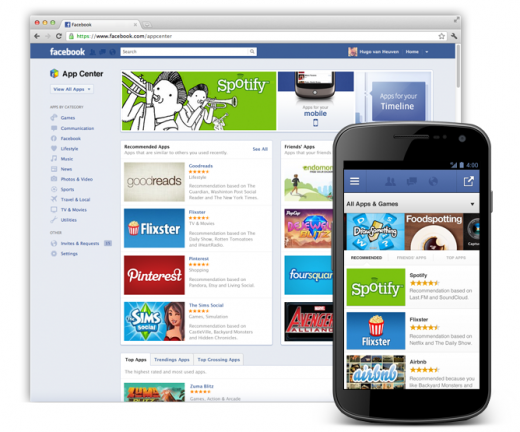 Facebook will sell social applications through the App Center. It is obviously a very smart move as it will allow their over 900 million users to buy the apps through Facebook. Developers are also being encouraged to create new paid-for apps solely for Facebook. Those who develop apps solely for Facebook will have to share 30% of the price with Facebook. An app detail page will describe to users how a particular app is unique and let them install it before going to it. Facebook will employ parameters such as user ratings and engagement, to decide whether or not a particular app will be listed in the App Center. A new app ratings metric in Insights, will be installed to help developers to monitor their users’ feedback. Apps will have a star rating based on Facebook’s social graph similar to Apple’s App Store. Apps that have a high rating will be prominently displayed on the App Center, while apps with poor ratings will not be listed. The App Center will be rolled out to users over the next few weeks. The launch of the App Center by Facebook just before their IPO seems like a smart move, allowing them to show investors that even though mobile is a risky area for them, they are proactively working on ways to earn money from the medium.